[SatNews] Moog Inc. (NYSE: MOG.A and MOG.B) Space and Defense Group will enable the second set of Galileo Full Operational Capability (FOC) Satellites to maintain their orbit 23,222 km above Earth. 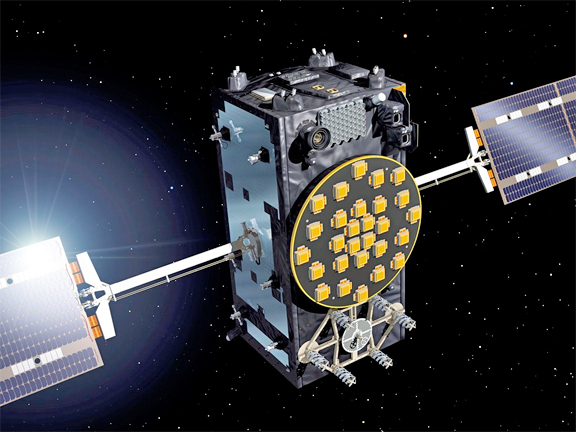 Artistic rendition of a Galileo Full Operational Capability satellite, with platforms manufactured by OHB in Bremen, Germany, and navigation payloads coming from Surrey Satellite Technology Ltd in Guildford, UK. The satellites, Adam and Anastasia (FM3 and FM4, respectively), launched atop a Soyuz-STB Fregat-MT rocket from Europe's spaceport in Kourou, French Guiana. The satellites, manufactured by OHB System AG in Bremen, Germany, are an integral part of Europe’s program for a global navigation satellite system, providing accurate, guaranteed global positioning service, interoperable with the US GPS and Russian GLONASS systems. The complete satellite system consists of 30 satellites in three planes of Medium Earth Orbit (MEO) and a ground infrastructure. Moog built the entire Galileo Propulsion System, which includes monopropellant engines, fill and drain valves, latch valves and pressure transducers including the complete thermal control system installation and harnessing. The propulsion system is a critical subsystem to the satellite, providing orbit maintenance and control capability, support of spacecraft de-tumbling, as well as attitude control in contingency cases (Ultimate Safe Mode). Moog leveraged the experience gained from the unique Fermi Gamma-ray Space Telescope (formerly GLAST) and critical Landsat Data Continuity Mission (LDCM) propulsion systems with successful launches in 2008 and 2013, respectively, and the high production volume experience from the ORBCOMM Generation 2 (OG2) constellation. Moog delivered all 14 propulsion systems for the first portion of the constellation, the second batch of eight is currently in the process of delivery. The complete system design, analysis, qualification, fabrication, test, and delivery of this new system was performed by Moog with sites in both the United States and Europe. The design incorporates Moog-built components with robust designs and heritage such as fill and drain valves from the United Kingdom; latch valves from East Aurora, New York; pressure transducers from The Netherlands; and thrusters from Niagara Falls, New York. Final assembly and test is performed at the Niagara Falls facility that has been delivering spacecraft and missile propulsion systems for critical national assets for over four decades. The Galileo satellites also include fine and cosine sun sensors supplied by Moog. Sun sensors are designed to deliver exact information about the position of the sun. This vital information is used for yaw steering of the spacecraft and therefore applied in earth pointing, solar array orientation and orbit control maneuvers. The first two Galileo FOC satellites were launched in August of 2014 to an erroneous orbit, due to a launch vehicle anomaly. The first of the two satellites began maneuvering into its corrected orbit in early November and in its revised orbit after more than a dozen maneuvers using the Moog-provided propulsion system. The first satellite, although not in the intended orbit, was placed in an orbit that is reduces the damaging radiation from the Van Allen Belts. Once this orbit correction maneuver was verified successful, the same adjustment was made with the second satellite. The second satellite started making its journey into the corrected orbit in mid-January, performing 14 total maneuvers over six weeks. The Full Operational Capability phase of the Galileo program is managed and fully funded by the European Union. The Commission and ESA have signed a delegation agreement by which ESA acts as design and procurement agent on behalf of the Commission.